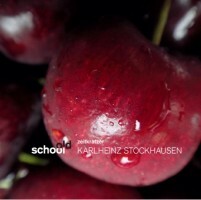 “zeitkratzer [old school] Stockhausen.” Karlheinz STOCKHAUSEN: Unbegrenzt, Verbindung, Nachtmusik, Intensität, Setz die Segel zur Sonne from Aus den sieben Tagen (1968). zeitkratzer. 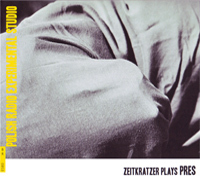 zeitkratzer zkr 0012 (1 CD) (http://www.zeitkratzer.de/). “Zeitkratzer plays PRES.” Eugeniusz RUDNIK: Dixi. Elzbieta SIKORA: View from the window. Krzysztof KNITTEL: Low Sounds; Norcet. Denis EBERHARD: Icon (for tape). 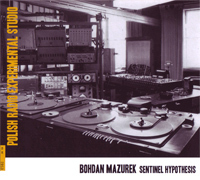 Bohdan MAZUREK: Episodes. All arr. zeitkratzer. zietkratzer. Bolt DUX 0811 (http://www.boltrecords.pl/). The zeitkratzer troupe gathered in Slovenia and Croatia to execute structured improvisations motivated by Stockhausen’s baffling instructions (“Play a sound / with the certainty / that you have an infinite amount of time and space”). We shouldn’t look at Aus den sieben Tagen with expectations of deep structure, although Robert Worby, along with a few Stockhausen fans, perceive serial architecture (cited in zeitkratzer’s booklet notes). Let’s accept that the complete set represents what some considered earnest music in May, 1968. With the correctly predisposed, Stockhausen’s poetic directions produce interesting results, for excellent example, zeitkratzer. Still, I hear a lot of intimidating and benevolent doodling. Stockhausen’s instructions don’t speak to me. Consider an opposing view. I suspect that Stockhausen would have agreed: Aus den sieben Tagen isn’t for every taste. The ensemble: clarinet/sax, French horn, trombone, electric guitar, piano, percussion, violin, cello, bass and sound manipulation, with ample evidence of non-standard technique. Zeitkratzer (re)created several electronic pieces from Polish Radio’s Experimental Studio (PRES). Unfamiliarity with the originals makes it impossible to judge the transcriptions’ faithfulness. Be that as it may, zeitkratzer worked its magic in constructing engaging moments. Ignorance of the originals permits the enjoyment of these as original compositions. Given my biases, I hear qualitative differences between the neurotic Stockhausen attempts and the well-structured PRES items. I wonder how they managed the Polish transcriptions. Did zeitkratzer listen to the tapes and improvise, or did director Friedl concoct a score? 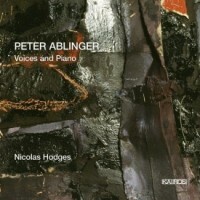 Peter ABLINGER: Voices and Piano (1998 to present). Nicolas Hodges (pno). Kairos 0013082KAI (1 CD) (http://www.kairos-music.com/). Historical and musical personages talk under and through the piano’s non-melodic gestures based upon spectral analysis of voice. At its completion the “song-cycle” will contain at least 80 pieces. At the time of the 2005 taping, Hodges recorded the existing 19. Ablinger scopes a compendium from which performers will take selections. This initial excerpt suggests a political direction (Bertolt Brecht, Lech Walesa, Mao Tse-Tung, Mother Theresa, Hanns Eisler and Ezra Pound) in addition to artists (Gertrude Stein, Marcel Duchamp, Pier Paolo Pasolini). Inasmuch as the piano’s pitches relate to the voices’ spectra, it’s sometimes difficult to discern what’s being said. This may well become a collector’s item for those who want an example of Morton Feldman’s New-Yawkese. 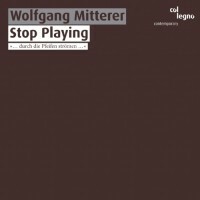 Wolfgang MITTERER: Stop Playing (2010). col legno WWE 1CD 20296 (1 CD) (http://www.col-legno.com/). 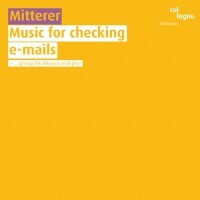 Wolfgang MITTERER: Music for Checking E-mails (2009). col legno WWE 2CD 20289 (2 CDs) (http://www.col-legno.com/). For Stop Playing, Mitterer mixed his frisking of three Austrian organs into seven pieces. Listening notes sketch itineraries. I don’t think the German title “Spiel mit den Registerzügen” puns as well as does its English translation. It is quite possible to be fooled into thinking that these are unedited tracks despite the occasional clicking and knocking. No slouch at organ or mixing desk, Mitterer extends detuning pitches when the motor is turned off with powerful whimpering and subtle blasts. Now and again an audible loop or skip reveals the digital knife. Music for Checking E-mails, a contemporary musique d’ameublement collection, spans two CDs (51:08 + 61:42) and contains a variety of mild ea collages as apt commentaries on time squandered on iPads. Disc one offers four large entrees, two with specific sources (hallo mr bruckner and pjotr ilijitsch) and two less obvious (to morton and bad receiver). While we may assume Feldman to be the third’s intended target, where the first two’s Bruckner and Tchaikovsky symphonies are in play, the sources aren’t as obvious. I hear some Vivaldi and what I take as traces of a Mozartian choral work. The notes credit “samples from the col legno archive” and “prepared piano and friends.” How lucky to have the keys to a candy store such as this! Disc two’s 22 tracks alternate short prepared piano doodles with modest concrète essays. Apply whichever sizes fit your needs. Paul D. Miller’s essay, an impenetrable wall of allusions and pretentions specific to Mitterer’s art, remains vague about what’s on offer. I do enjoy those passages that blend field recordings with cropped symphonic crags, as in Beethoven’s Leonore spread across a factory floor. 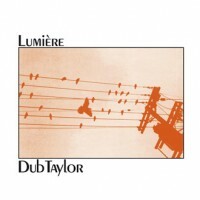 Dub TAYLOR: Lumière (1972); Variations on the “Dudley Do-Right” Theme (1974). Sub Rosa SR327 (1 CD) (http://www.subrosa.net/). Lumière’s two parts (17:18 + 15:04) represent the real-time mixing of pre-recorded artifacts (radio and homemade samples) and some ARP 2600 synthesizer noodlings. Taylor captured all manner of 1969-72 Los Angeles-period artifacts plus the Beatles, Tom Jones, and 2001’s HAL. We’re to admire that the collage was achieved manually, as one might play a sampler today: no studio splicing or dubbing. As a bonus, we get a tiny encore. The Dudley Do-Right Variations enjoy a bit of concrète fun with intrinsically goofy materials the distinctive characteristics of which remain recognizable upon transformation. “Sentinel Hypothesis.” Bohdan MAZUREK: Six Electronic Preludes (1981); Bozzetti (1967); From a Notebook (1983); Canti (1973); Sinfonia rustica (1970); Ballade (1976); Pennsylvania Dream (1987); Children’s Dreams (1976); Daisy Story (1977-79); Reverie (1989); Letter to Friends (1986); Epitaph (1st version) (1969). Bolt DUX 0814/15 (http://www.boltrecords.pl/). Mazurek (b. 1937) was a principal sound engineer at Polish Radio’s Experimental Studio (PRES). In the analogue era, this was not an easy employment. Mazurek’s fluency took in acoustic instruments and studio gadgetry. Less experienced composers would rely upon him for navigating the electronics’ potential. Mazurek, whose own compositions, film scores and radio cues began to appear in 1966, gained proficiency and respect as technician and composer of live electronic work. All ea practitioners aspire to poetry. Most, myself included, rarely become more than technical cataloguers. This double-disc anthology firmly establishes Mazurek’s excellence. The booklet recognizes his scope yet skimps on details, such as a complete work-list. It also fails to mention whether the man is alive. The paperboard digipak program indicates tracks without dates. (They’re in the booklet.) The 1981 Six Preludes’ electronic sources suggest the pre-synthesizer era. One of the earliest items, Canti, reveals a remarkably precise handling of concrète elements. Mazurek’s style is remarkably consistent through the decades. He crafted sound tracks for children’s programs, including Children’s Dreams’ five vignettes, which impress me as sinister. Daisy Story contains a transformed voice and Tudor-like rainforest effects. Mazurek’s ironic humor informs Pennsylvania Dream, with its layered Chopin, trains and horses more suggestive of Poland. Letter to Friends’ light-hearted gestures compete with Beethoven shards.